Call me a philistine, if you like, but to my ears, music without form, structure and harmony is just a jumble of chaotic noise. 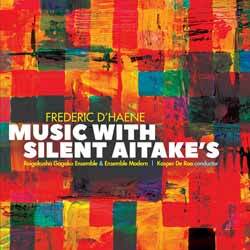 And that's probably the best way to describe Frederic D'Haene's new album, Music With Silent Aitake's. This was not a pleasurable listening experience. In fact on a number of occasions it was actually quite jarring - causing me to turn down the volume. In fact, if I'm being honest I wouldn't have listened to the whole thing if I wasn't reviewing it... Sadly, this was one of the few recordings where repeat listens were unnecessary. When listening to 'Part II - Gagaku 1 - haya yo byoushi' I thought I'd suddenly developed tinnitus, as there are long passages of high pitched sounds that are not too far removed from the sensation of ringing in the ears. It then transforms into something that sounds like we're visiting The Planet of the Apes, before going back to the high pitched noises. For lovers of experimental music, who like to be thrown off balance... this will be just what you're looking for. Personally, while an interesting experiment in combining the sound of a Western instrumental ensemble with that of a traditional Japanese gagaku orchestra, it's not an experience I'd want to revisit.